It’s common to see lack of impulse control for dogs and small children. We all know an adult or two that suffers from it from time to time, too! It is lack of impulse control that makes dogs rush headfirst into danger. Uncontrolled dogs bowl people over in their enthusiasm to say hello. And they also display thoroughly bad manners in the presence of food. All this is perfectly natural. But especially with friendly, and greedy dogs, it is not a good thing. One thing we can do is train a dog to respond to specific commands. We can teach a dog to sit still in the car whilst we open the door by telling him to sit, or stay, or wait. We can teach, “Leave it,” to tell a dog to back off and ‘not touch’ when you give the command. But this article is about a slightly different approach. We can also teach dogs to control their impulses in specific situations, without the use of commands. We do this by creating default behaviors. These are learned behaviors that the dog offers in response to specific situations, rather than in response to a signal from a person. We can teach a dog that the only way to get through a door is to sit politely in front of it. We can teach him that the only way to get someone to stroke him is to keep his feet firmly on the ground. He can learn that the only way anyone will clip on his leash is if he stands quite still. And the only way you will put his dinner bowl on the floor is if he sits and looks at you. A nice thing about default behaviors is that the dog is making his own decision, rather than being told what to do. He is having to think, and use his brain. This is good mental exercise and helps him improve his learning skills. He is learning that choosing calm and polite behaviors is more likely to get him what he wants. And the more situations in which your dog learned to control his natural impulses, the easier he will find it to learn new ones. Impulse control is something that dogs become better at with practice. Many dogs behave very badly when they think they are going for a walk. They see the lead come out or hear the jingle of your car keys, and go to pieces. Some dogs bounce up and down, or race around the house knocking things over. Others bark repeatedly or spin in silly circles while their owner tries unsuccessfully to get them to sit still. Does your dog appears to be hysterical with excitement each time you leave the house? If you have to wrestle him to the ground in order to clip on his lead, instead of giving commands he is never going to obey, try this little exercise. This is for owners of dogs that spin and/or bounce when they see their lead. Do this exercise when you have at least an hour of spare time and know that you will not be interrupted. Your aim at this point is to hold the lead in one hand and grasp the dog’s collar with the other, without him moving. But don’t touch him yet. Get out your dog’s lead and stand quite still, holding it in your hand. Reach your other hand out towards him. Withdraw your hand and wait him out again. Each time he stops, reach out your hand. Withdraw it as soon as he starts the behavior you don’t like. Be patient. The first time you do this it will take a while. In fact, the spinning and bouncing may be worse than ever for a while. This is because the dog believes that the spinning and bouncing gets him a walk. This is a perfectly reasonable assumption on his part. So when you behave strangely and refuse to put on his lead, he may spin and bounce harder to begin with. 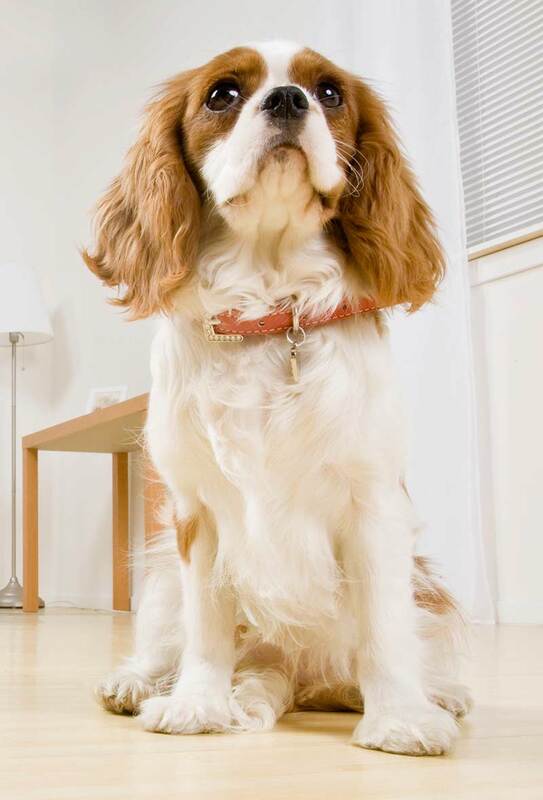 Sooner than you think, your clever dog will have a “Eureka!” moment. “This isn’t working,” he will say to himself. And he will try something different. He might fetch you a shoe. Or his dinner bowl. Just ignore him and wait. Clip the lead on his collar and reward him. Having the lead on is in itself rewarding. You can make it more so. The extra reward can be food or the walk he was hoping for. He just needs to know that standing still is what works. When this happens, you have made a major breakthrough. From now on, it all gets easier. Repeat this little training session as many times as you can over the next few days, and make a commitment to these new standards. From now on, never clip a lead on to your dog until he is standing quietly. You can wait for him to sit if you want to, but standing still is fine. Never let anyone else clip a lead on to your dog until he is standing quietly. You are now teaching the dog that he need have no doubt that standing still is what gets him a walk. And he needs to know that from now on, you will not attach a lead to his collar under any other circumstances. 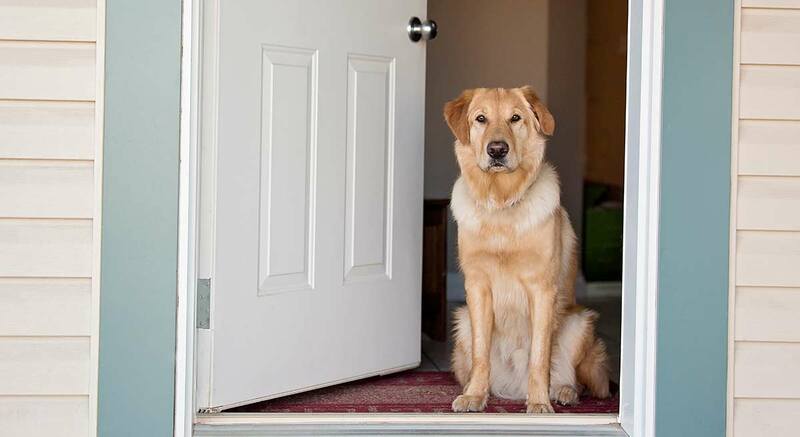 You can use the same exercise for a door-barging dog. Hold your hand on the door and wait for the dog to back away. Don’t start to turn the handle until the dog has backed away from the door. In fact, you can apply these principles to many other behaviors you want to eradicate and replace with a different behavior. There are no complications, no commands, no talking. Just wait the dog out. You can do it! Give it a go, and let us know how you get on!